Engineers have received £1.5million in funding for a new battery energy storage project that could mean more efficient and cheaper trains. 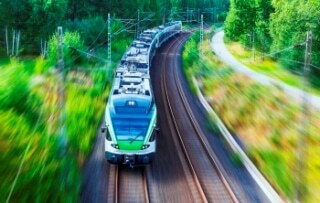 The TransEnergy project led by the University of Sheffield, will work with Network Rail to investigate how battery storage could be used to power our railways. As train companies try to increase the frequency of trains on existing railway infrastructure, electricity supply is under greater pressure to be available at peak times. Engineers will study whether batteries from electric vehicles parked at train stations could supplement the system at busy periods. Commuters could receive free parking in return for their electric cars being used as back-up batteries, providing Road to Rail energy exchange. The use of batteries will reduce the demand for electrical energy supply in these periods and could mean rail operators benefit from more efficient and frequent services. Passengers could in turn benefit from reduced costs and more train services. A recent report by the National Infrastructure Commission has suggested that energy storage technologies could contribute to innovations that could save consumers up to £8 billion a year by 2030, help the UK meet its 2050 carbon targets, and secure the UK’s energy supply for generations. Funded by the Engineering and Physical Sciences Research Council (EPSRC), the project involves partners from the University of Leeds and the University of Southampton. The team will develop a purpose-built energy storage test facility at a site alongside a train line, the first of its kind in the UK. The facility will investigate two types of energy storage - batteries and supercapacitors as a hybrid solution for the high levels of electricity needed to power trains accelerating and charge from trains braking. Dr Martin Foster from the University of Sheffield’s Department of Electronic and Electrical Engineering said: "Electric powered rail travel has helped to reduce pollution and improve the comfort of travellers. Our project will look at how we can meet the demand for more electricity on our railways by investigating innovative ways to store surplus energy.